This May Day is gloomy and cold and rainy. It is a desperate day. I walked up the path and I was reminded that it is still wild garlic season. Every stage of wild garlic season is a pleasure. First there are the little shoots coming up and the bright fresh green colour is full of promise. Then the leaves push all the way up and they are a shiny darker green. That is when I think both the smell and the taste are the strongest and the best. Then the buds appear and the leaves lose a bit of their shininess. Slowly, the star-like flowers start appearing like little explosions. The leaves look duller but the flowers make it all look exciting. It tastes and smells good at every stage. I like walking up the boreen and stepping on it and smashing some down with my boots just so that I can walk in a cloud of the smell. 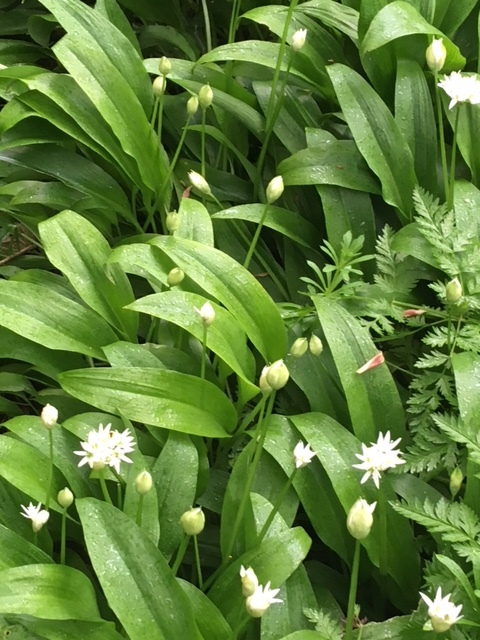 There is nothing that is not good about the wild garlic season. I dropped some carrots on the floor. They snapped into pieces. Carrots are usually a bit bouncy. I think of carrots as rubbery rather than brittle. The floor in the kitchen is a stone floor. Most things break when they hit a stone floor. But it seemed odd to have carrots snap into clean halves like these did. I grated a few of the carrots for a salad at lunch. They were watery and completely without taste. I wish I could remember where I got these carrots because I do not want to buy them again. Leaving Dublin on the bus with a man shouting into his phone. No one could read or sleep. No one could not listen. 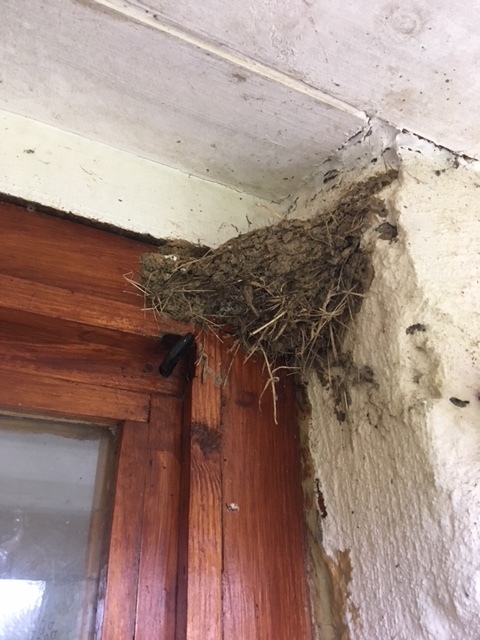 The swallows nest in the corner by my door is still in position from last year. The birds left and the nest remains. I have gotten used to it being there. I do not really see it anymore. But now there are birds everywhere. They are all flying around with bits of sticks and moss in their beaks. Nest building activity is manic even though the weather is colder than it should be. The weather is horrible. I think I should remove the nest from the wall before anyone decides to use it again. I do not know if swallows use a nest for a second time. Nor if other birds move into any old nest just for the convenience of not having to build their own. It was interesting to have the mother and the chicks in the corner for a while, but then I had to give up my room. I was driven away by the mother trying to protect her young. I would rather not go through all that again. By the time everyone had learned to fly there was crunchy excrement all over the door and the door handle and the step. I thought I could just pull the nest off today in passing but I think I will need a chisel. It is tightly welded to the wall with mud and bird spit. And since it is now raining and the rain is lashing sideways, I shall do it later. Celly Ryan was the name on the small van. It was a private bus service. The driver was standing near the van with the door open. He was waiting for his passengers to return. I think the vehicle could seat 6 or maybe 8 people. I wish I had stopped to ask the man what Celly was short for. Celestine? Celeste? I cannot think of a man’s name that might be shortened to Celly, but I am trying. A blue security van arrived while we waited at the station in Cork. The man driving it made a careful backing up to the door on the side of the station. It took him two or three tries to get into the exact right position. When he finished he was perfectly in line with the door so I assumed he would rush out of his van, do some efficient moves and take money in containers into or out of the station and then quickly drive away again. He got out of the van and took two small silver suitcases out of the special door. He also removed two pouches which he put under his arm. He walked around the van towards the station and then he met a man he knew. He put the two cases down on the back bumper of the van. It was a flat bumper and it easily held the two silver suitcases. The two men shook hands and then they both lit cigarettes. As they talked a third man came along. They all shook hands again and then they moved about ten steps away from the van until they were standing in the sunshine. The sun was warm on an otherwise cold day. It was warm in the sun and very cold in the shade. The driver kept the two pouches under his arm while he talked for about 20 minutes. He had his back to the van and the suitcases. The silver suitcases seemed to be forgotten. Two small boys came along. They each picked up a suitcase. One of the men saw the boys and nudged the driver. He turned his head and said, “Go away, Lads and leave my cases where they are.” The boys put the suitcases back on to the bumper and they wandered off. The driver stood in the sun for another 10 minutes and then he said good-bye to the two men. He went into the station with the pouches and the silver suitcases. He came out with some different things and he drove away. None of his activity seemed as imperative as getting the vehicle in an exact straight line with the door. 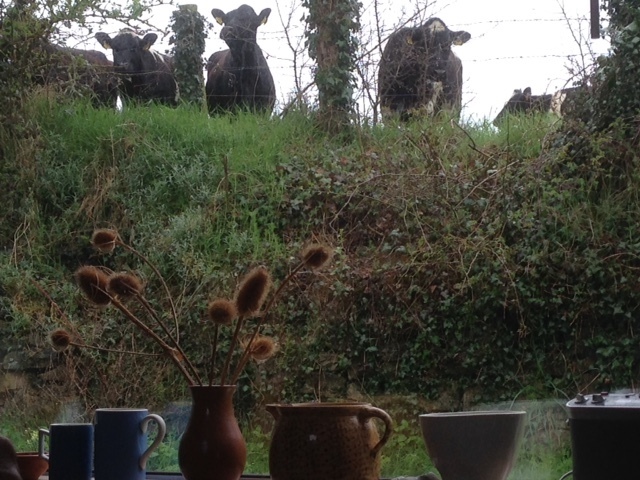 The cows are in the upper field. They are looking into our windows which means they are looking down and into our windows and watching us from an elevated position. It is not often that cows are in that field and when they are they are not always so interested in what we are doing. This group seem determined to catch our attention. They seem determined to want us to look back at them. This group is very interested in us. There might be one or there might be two or three or four and then they run off and away together and then two more come. I am always facing them from my seat at the table. I wave. I smile. I nod. I have no idea if any of this registers with them. We cannot eat breakfast, lunch or dinner without attracting an audience.